Photo supplied by Dorothy. 2014 District Swimming Gala with fellow APS Ben, theme was the South Sea Islands. 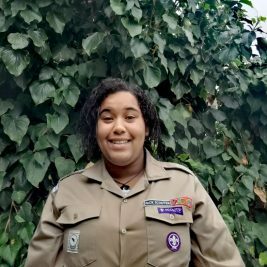 I come from a family where Scouting and Guiding is considered important. 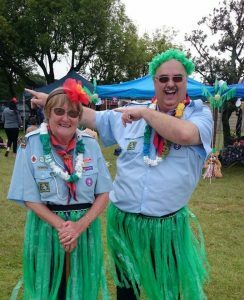 I first became an “Assistant Cubmaster” in March 1959 after having been a Brownie, Guide and Ranger. The then Cubmaster, an RAF National Serviceman, wanted continuity in the Pack when he was demobbed, so had requested a local girl to train to take over from him in a few months’ time. I suppose I understood boys as I had three younger brothers, all involved in Scouting. I had wonderful times with the boys of 1st Watton. They very soon became my “second family”. My new husband’s job took him to Sydney and I joined 1st Caringbah as an ACM for three wonderful years. On our return to England I started a Pack (now a flourishing complete Group) at 1st Bottisham, Cambs. Then my husband was transferred and I started a second Pack in the Corfe Mullen Group, Dorset. A year later we left for South Africa where I was asked to take on 1st Benoni. A while after they were moved out of Benoni itself so I took over 2nd Benoni where I remained for around 30 years until we joined 4th Benoni, where I still am APS. During my 57 years as a leader I have seen that no matter what the decade or the country, youngsters are still pretty much the same. 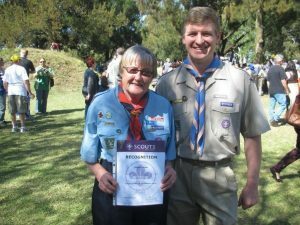 Dorothy receives recognition for 50 years of volunteering from Dr Brendon Hausberger current Chief Commissioner, but RC at the time. While reminiscing about the role Cubbing has played in my life, I remembered two very heart-warming experiences in the last two years. I needed a cataract operation so I went to Greg, one of my first South African Cubs and now a respected ophthalmologist. Impromptu he told me that Cubs and Scouts were good days and had taught him and his friends values and principles which they live by to this day. The other day I met Adrian in the supermarket – I hadn’t seen him for over 30 years – during our conversation he reflected that in his training as an SAA pilot he had put his Scout training to great use and when asked by trainers how he managed to be so much better than everyone else he simply replied “I was a Scout”. There must be many I haven’t heard about who’ve really made something of their lives, in no small part due to their Cub and Scout training. Another former Cub Adrian, (1st Watton) became a policeman and told my mother that he had become a policeman because “Duty To The Queen” was such an important part of his Cub Promise that he had decided to become one. He subsequently rose to become the youngest Chief Constable of Norfolk. Ian, (2nd Benoni), had probably last seen the inside of a church when he was christened, but as we were a church sponsored Group, he was encouraged to attend Sunday School. He finished up becoming an Archbishop somewhere in the West Indies, doing his “Duty To God”. Andrew, (1st Watton), was dying of leukemia. Despite the extremely painful bone marrow extractions, he never complained and told the amazed doctors that as a Cub he had to grin and bear it. Why am I proud to be a Cub leader? The above tells it all!